In the first-season episode “Volcano,” Stan’s uncle takes the boys on a hunting trip while, simultaneously, the titular volcano threatens to destroy South Park. Cartman is mocked for telling the legend of Scuzzlebutt, a terrifying basket-weaving creature with a celery arm and a Patrick Duffy leg, and Stan’s masculinity is questioned when he refuses to kill any animals. In the end, the volcano erupts, and, though the town manages to save itself, Stan, Kyle and Cartman are rescued by the real Scuzzlebutt, who weaves a basket to carry them safely over the lava. Upon reaching safety, Stan immediately attempts to prove his manliness by shooting Scuzzlebutt in the head, which only ends up making everyone mad. Meanwhile, back in the ‘70s, in the epic two-part episode “The Secret of Bigfoot,” Steve Austin links the disappearance of two scientists to Bigfoot. After tracking the creature down and trying to communicate with him, only to be violently rebuffed, The Six Million Dollar Man fights the creature, which takes flight after Austin tears off its arm. Austin then pursues the monster to a cave, where Bigfoot is revealed to be an intelligent android built by aliens to guard their mountain base. Though created more than two decades apart, both of these storylines engage with the uniquely American consideration (maybe even hope) that Bigfoot is a benign, gentle creature, perhaps more human than animal. Scuzzlebutt (an obvious Bigfoot analog) is revealed to be a magnanimous craftsman who puts himself in danger to save the children. During Steve Austin’s initial encounter with the beast, Austin tries repeatedly to talk not just at the creature, but with it. How can we use these distinctly American narratives to uncover how Bigfoot has been sculpted into a national icon? The Six Million Dollar Man two-part episode is interesting as an artifact from the beginning of America’s pop cultural fixation on Bigfoot. 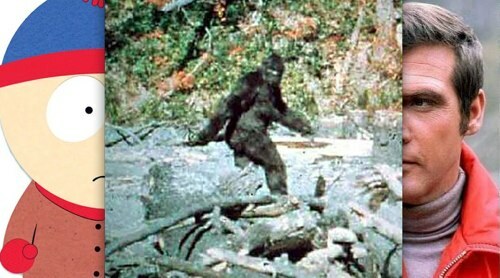 From the discovery of a giant footprint to the first sighting of the creature ambling through the woods (a clear homage to the infamous Patterson-Gimlin footage), the show’s portrayal of Bigfoot (up until the sensationalist, ratings-hungry robot reveal) hinges on his starkly uneven elusiveness-to-size ratio and the taxonomical theory that he is a missing evolutionary link between primates and man. While it seems obvious to regard the latter point, evolutionary kinship, as the root of the country’s fixation, it’s important to consider that Bigfoot-like creatures are a globally reported phenomenon, but few others are afforded the same national affection (or adorable nickname) as Bigfoot. 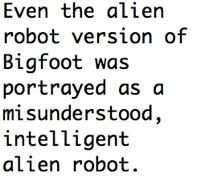 Even the alien robot version of Bigfoot was portrayed as a misunderstood, intelligent alien robot. While it’s true that his bipedal posture and supposedly humanoid face lend Bigfoot a bit more hugability than, say, the horse-headed, bat-winged Jersey Devil, there’s a huge leap being made from possible threat to anonymous creature to probable friend. So, what’s aiding Americans’ minds in making this jump? Well, on television, the Jersey Devil is going to be an anonymous puppet or special effect. Bigfoot, on the other hand, because of this supposed evolutionary kinship, can be played by a human. Everyone who watched The Six Million Dollar Man, for example, saw the creature as portrayed by a Muhammad Ali, and that image was branded into the cultural consciousness. To oversimplify: America sees Muhammad Ali as Bigfoot, America loves Muhammad Ali, ergo, etc. And that’s just one portrayal on one show. Bigfoot was a fixture of narrative TV in the ‘70s; the more people see a monster personified, the less they see the monster. Here’s where South Park comes into it – while Scuzzlebutt’s Patrick Duffy leg seems like a silly pop cultural non sequitur, it manages to perfectly articulate this precise point: folklore is no less susceptible to pop culture than music or film. In his story, Cartman characterizes the creature as a bloodthirsty beast that kills people in order to “add pieces to its deformed body.” This quote almost reads like hyperbolized meta-commentary on pop culture itself, and the way it’s constantly assembling and re-assembling its own amorphous form and the form of all of it components, Bigfoot included. The underlying non-threatening folksiness hinted at by Scuzzlebutt’s celery arm and penchant for basket weaving reveal another constructed trait that Americans have projected onto Bigfoot; If it’s assumed that Bigfoot is, in fact, more human than primate, his humanity is an older version, untouched by technology and the social complexities of the modern world. Given America’s obsession with idealizing an unobtainable past, it makes sense that people would find something attractive and mysterious about this kind of basic humanity, and the way Bigfoot supposedly carries it around inside of him, like he’s the last fluent speaker of some ancient, forgotten language. The real Bigfoot remains a mystery. In the meantime, the country has stitched together the Bigfoot it loves. It has a Muhammad Ali leg, an idealized past arm and a wealth of the other disparate pieces of our national identity that have been offered up and subsumed in the name of creating a truly American monster. Matt Finley is a regular Weird Things researcher currently based in Cleveland. His blog can be found here and you can follow him on Twitter at @Finfizzler.